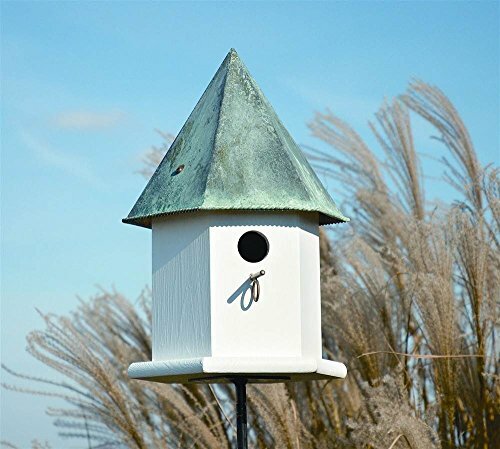 This Songbird House has 2 compartments and is designed for a wide variety of small songbirds such as chickadees, finches, wrens, and bluebirds. This elegant house is made out of cellular PVC, which will not rot, split, or fade, with a shiny copper roof. This birdhouse will light up any yard and also be a great home for birds. Mounts on true 4x4 Custom sizes are available per request. Center divider can be removed to convert to single compartment bird house. 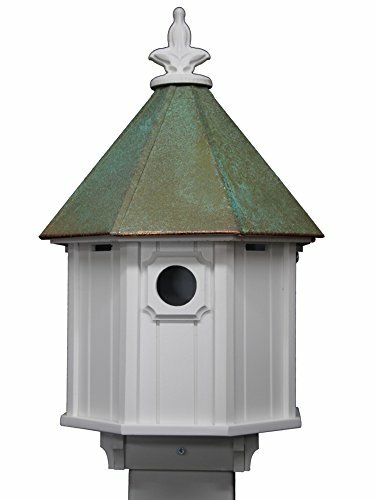 This Octagon House has 2 compartments and designed for a wide variety of small songbirds such as chickadees, finches, wrens, and bluebirds. This elegant house is made out of cellular PVC, which will not split, rot, or fade, with a verdigris copper roof. 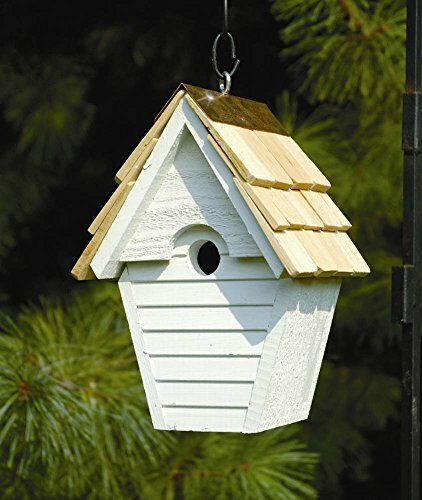 This birdhouse will light up any yard and also be a great home for birds. Mounts on true 4x4. 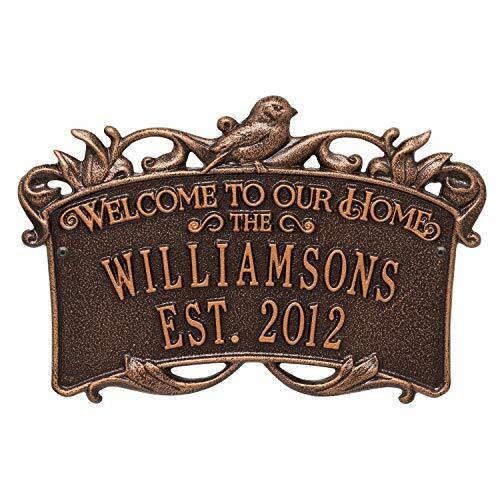 This beautiful silhouetted Bird and Branch design with large ribbon shape welcomes friends to your home. Space for Family name and established date. A stylish hexagonal body of solid Cypress & a six sided solid copper roof. 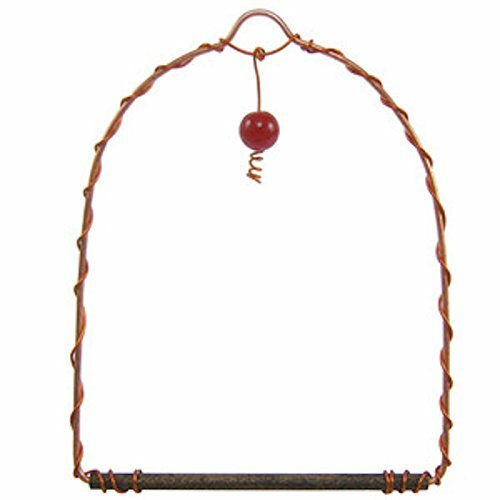 Hanging loop & matching copper perch Complete the look, easy clean out & optional mounting. Wood ceiling keeps things insulated good ventilation. 1 1/2 in. Hole works for Chickadee, bluebird, swallow, Nuthatch, titmouse & wren. Hand crafted in the USA. 12 in. L x 12 in. W x 18 in. H.
A stylish hexagonal body of solid Cypress & a six sided solid copper roof. Hanging loop & matching copper perch. Easy clean out & optional mounting. 1 1/4 in. Hole works for Chickadee, Nuthatch, swallow, downy Woodpecker & wren. Hand crafted in the USA. 7 in. L x 7 in. W x 15 in. 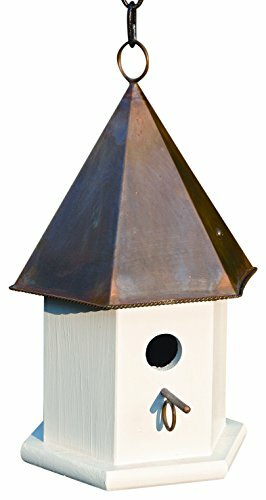 H.
Create an entire "upscale" neighborhood for your local birds to call home with our Set of 4 Condominium Style Bird Houses. Each is handcrafted with a beautiful antique copper finish, multiple doors for at least 4 birds, and detailed branch & leaf detail. They were purposefully created with a long, thick, four-prong stake in order to provide the best stability for these heavy birdhouses against wind and other influences. This aviary's meticulous construction and easy access will have your skies chock-full of chirpy songbirds. Built to provide years of enjoyment, it features natural cypress wood construction, a copper trim on the roof, oversized shingles and free-hanging design. The graceful wren in the Wind will double as a spectacular air show. Made solid cypress wood which is naturally resistant to decay and insects. Features copper trim and includes drainage,ventilation and rear panel clean out. 1 1/8 in. hole perfect for wrens who don't mind their homes swaying in the breeze. Proudly made in the USA. 6 in. L x 8 in. W x 12 in. H.
This mahogany wood finished hexagonal birdhouse blends beautifully in with your garden or landscaping & provides a safe place for songbirds to nest. 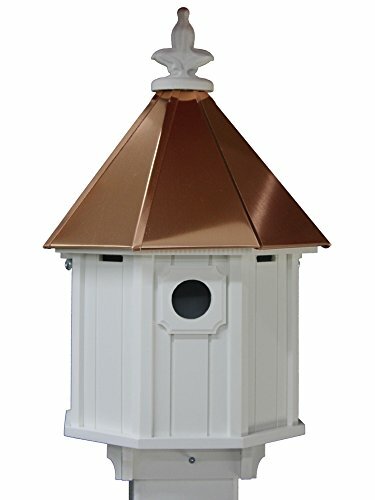 A shiny pointed copper roof & matching perch add decorative touches to this charming piece. Just hang & enjoy! a stylish hexagonal body of mahogany & a six sided solid copper roof. Hanging loop & matching copper perch. Easy clean out & optional mounting. 1 1/4 in. Hole works for Chickadee, Nuthatch, swallow, downy Woodpecker & wren. Hand crafted in the USA. 7 in. L x 7 in. W x 15 in. 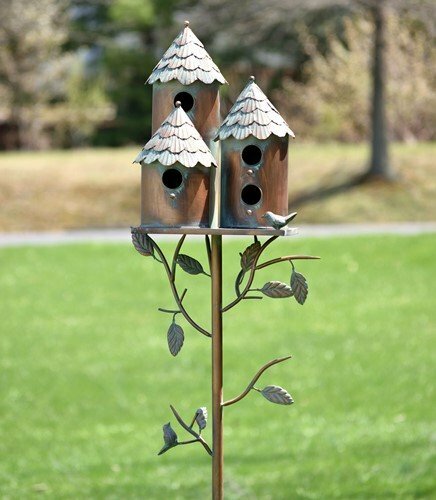 H.
Looking for more Copper Songbird House similar ideas? Try to explore these searches: Porsche 928 Racing, Fender Tremolo System, and Drop Pink Gemstone. Look at latest related video about Copper Songbird House. Shopwizion.com is the smartest way for online shopping: compare prices of leading online shops for best deals around the web. 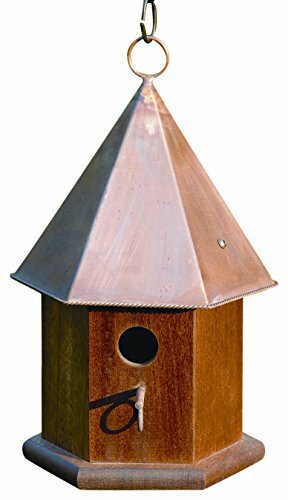 Don't miss TOP Copper Songbird House deals, updated daily.